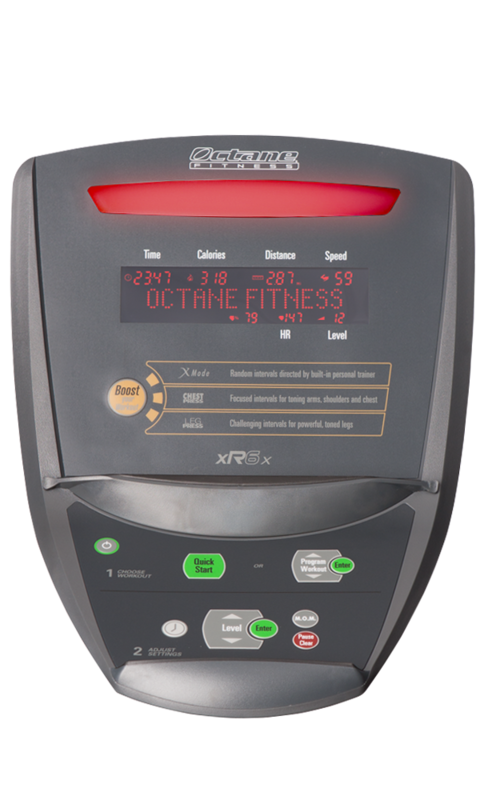 Price listed is for the elliptical as defined in Specifications (photo may differ). • Pull-Arms – concentrate on pulling the moving handlebars against a 10-level bump in resistance to focus on your biceps and lats. • Push-Arms – concentrate on pushing the moving handlebars against a 10-level bump in resistance to focus on your triceps and chest. • Narrow Grip – grasp the lower/inside portion of the multi-position handles and push and pull to focus on your triceps and chest. • Wide Grip – grasp the higher/outside portion of the multi-position handles and push and pull to focus on your chest, shoulders and back. The invigorating Chest Press makes it easy to incorporate a strength session for your chest, back and arms into your aerobic workout. Once a minute, this Workout Booster cranks up the resistance by 10 levels and prompts you to place your feet on the foot pegs to ensure you use only your upper body for a muscle-burning, 10-repetition set.